I just can’t stop making reindeer cupcakes! I’m out of control! This version of Rudolph, great for Christmas parties, uses chocolate covered pretzels for the antlers. If you have trouble with your antlers flopping over (poor reindeer! ), you can stabilize them with toothpicks, but take them out before giving to children. What You Need: 1 cupcake; milk chocolate frosting; chocolate-covered pretzels such as Flipz; 2 black or dark brown M&Ms; cherry sour ball. How to Make It: Frost cupcake. Stick pretzels into cupcake (you may want to cut little slits for them). Add eyes and nose. 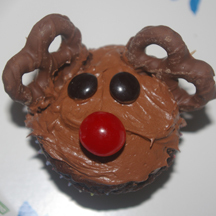 This entry was posted on Friday, December 17th, 2010 at 10:28 am	and is filed under animal cupcakes, Christmas cupcakes. You can follow any responses to this entry through the RSS 2.0 feed. Responses are currently closed, but you can trackback from your own site.